More than a Pair of Chutes: Under 200 days! I usually don't go to my blog page, I just check on my dashboard. 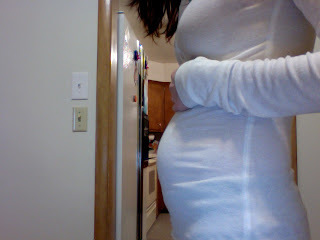 But, I went to my page today to check how many days are left until my due date, (I have a ticker). It's 195 days! I am so excited to be under 200. Plus, I had a feeling good day today. It's because Troy's out of town. It seems the last two times he's been gone, I've felt good, so I could take care of the girls. Maybe it's all in my head. And yes, it's taken with my new Mac! Yay!!! Which leads me to another camera question. What is your favorite editing program? I could probably buy one, I usually get what I want, ha ha, but I would love to find a free one right now. And, it has to be great on Macs. I took some neat pictures of the ice this morning, but they're on my other computer. I will see if I have enough initiative to grab it and add them. We had the craziest storm Friday night. It was so blowy. We were at a friend's house and had to drive home through it. We weren't worried since we have a 4 wheel drive truck, but it wasn't really even necessary most of the drive. It was blowing so bad, it was "white out" conditions. I have never experienced anything so bad. A couple of times, we had to stop and figure out exactly where the road was judging by the telephone poles. Ah, the joy of living in farmland. I think you are doing great with your camera. I don't have advice on any editing programs - I haven't ever used one. Let me know if you find a good one! Look at that cute baby belly! Yippie for your Mac find! I just love running across a good bargain. I have Photoshop Elements 6 for Mac. It's wondermous, and not too pricey. A good free one that works great with a Mac is Picnik.com!